Media: Soft, glossy, colour covers; 21.5cm x 28cm portrait format, printed in black and white on 112 good quality, semi-gloss pages. Includes 19 pages of colour artwork by Richard J Caruana and many black and white, plus some colour, photographs. Advantages: Good selection of photographs and numerous colour profiles. Published simultaneously with their book on the De Havilland Sea Vixen, 'Gloster Javelin– The RAF's First Delta Wing Fighter' is Dalrymple & Verdun's latest title in this series and, as with the former, is also penned by author Richard A Franks. The book's format follows the now established style, being just under A4 size, having soft covers bearing a distinctive, 'Pop Art' style, cover artwork. Printed on semi-gloss/satin pages, the main chapters are supplied with some 150 black and white (plus some colour) photographs and technical line drawings. These photographs are excellent, showing the Javelin in development as well as front line service. As now seems to becoming the norm in this series, these photographs are culled from a wide range of sources, with many of them having not been published before. The text is reasonably comprehensive and follows the life of the Javelin chronologically, from Ministry specification (including the reasoning behind the choice of a delta), through the somewhat 'difficult' development phase and finally into its service career at home in the UK, as well as overseas. Complimenting the photographs, there are some 19 pages containing over 55 colour side profiles and 4-view illustrations by Richard J Caruana, covering the aircraft in squadron service (grouped by version) and as a trials aircraft. 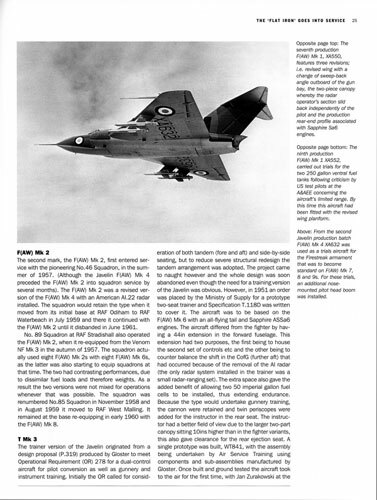 The story of the Javelin is covered by the book in seven chapters, with chapter one covering the background to the choice of a delta for this aircraft and the links to the parallel development of the DH.110, De Havilland's prototype Sea Vixen. The remaining chapters cover; the protracted development phase ('Testing, Spinning and Super-Stalling'), introduction and service operation ('The 'Flat Iron' Goes into Service'), operational use overseas ('The Javelin Abroad'), the technical aspects ('Javelin Technical Description and Armament'), lists and proposal drawings for Javelins real and imagined ('Projects, Proposals and Drawing Board Javelins') and finally, detailed information on the various service and other schemes ('Camouflage and Markings'). There are also three appendices: 'Technical Data' on the Mk's 1 through 9, plus the T Mk.3; 'Javelin Squadrons', including selected units and those used in Government research, and finally 'Javelin Production' (mostly with just a brief note on each serial's squadron allocation, occasionally with a more detailed history). The book concludes with Glossary & Bibliography page and an Index page. Having recently also finished reading the 'sister' title (if I can call it that) in this series, on the Sea Vixen, it is tempting to draw comparisons. Both aircraft were big and bold solutions to perceived threats and both had troubled development phases. Both were also twin-engined and gave the delta wing concept its first real test in service use, both becoming 'iconic' aircraft of their respective Services. 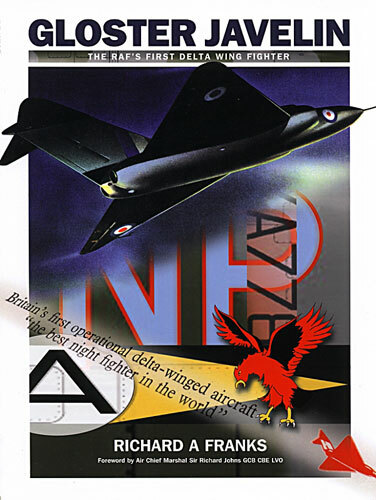 Comparing the two books, Dalrymple & Verdun's 'Gloster Javelin– The RAF's First Delta Wing Fighter' is certainly on a par with their 'Sea Vixen' offering, whilst the inclusion of technical line drawings this time round, is a welcome enhancement. Again, this is a useful book for the modeller and whilst the text is still very informative and useful, it is again the photographs and colour profiles which will probably be of most interest to buyers. This is particularly true, when allied to the information on aircraft colours and schemes in chapter seven and the aforementioned technical drawings. 'The most distinctive fighter of the Cold War'? Almost certainly. This 'brute' was the RAF's first missile-armed jet fighter (1955) and remained in service until 1968 before replacement by types such as the Lightning. Perhaps perceptions of the Javelin have been coloured, like the Supermarine Swift, by its early teething troubles and, like the Swift, really only excelled in its final form. This book certainly shows the Javelin in a much better light, dispelling some of the myths and so will surely provide modellers with the inspiration to add one to their collection. Review copy, courtesy of my meagre finances.